This post is a reflection on my own experience in memorizing piano works, and how this has declined with age. As a teenager, and in my twenties, I learned a considerable number of the ‘big’ piano works, including the Liszt sonata, several Beethoven sonatas including the ‘Hammerklavier’, Schumann Fantasy, Schubert Wanderer, Brahms Handel variations and many of the Chopin Ballades and Scherzi, and played them all in public. I never remember thinking specifically about ‘memorizing’ them, as such – because it was totally automatic, and happened without any effort. There was simply no problem. Although I was a busy medical student, I could absorb large-scale works in the holidays, rapidly and reliably. They are still stored away in my brain, and will be for ever. I suppose it is a sort of ‘finger memory’ although I find it difficult to analyse – it just happens. However my ability to memorize repertoire started to decline from the age of 25 onwards, as I think it probably does in everyone. I am now 71, and over the decades, it has become harder and harder (ie virtually impossible) to memorize new pieces. It requires much more effort, and the pieces feel correspondingly less secure. This increasing insecurity at the keyboard has resulted in more performance ‘nerves’, and I suspect it is the main reason why pianists tend to become increasingly anxious about giving concerts as they get older. I have now completely lost my nerve, and have given up recitals. Memory lapses are indeed every pianist’s worst nightmare. Odd technical slips are quickly forgotten, but if a pianist grinds to a halt, in the middle of a work, this is simply catastrophic – he/she is ‘dead in the water’ and there is no way back ! I am fairly certain that this dreadful prospect lurks as a dark shadow in the back of most pianists’ minds during recitals, particularly as they get older. I am surprised how many of the 300+ pianists playing in my concert series, most of whom are under 30, have had minor memory lapses, which may not always be noticed by the audience (although I usually spot them), but they must be very unsettling for the performer. Some manage to extemporise their way out of a disaster, and find their way into the piece again. I have huge admiration for them – it must be absolutely terrifying. A young pianist recently played a Scarlatti sonata in F minor, and got ‘in a loop’ and ended up quite convincingly in C minor, but no-one in the audience noticed anything awry and applauded enthusiastically. Of course, there is absolutely no reason why the music shouldn’t be used, as indeed Curzon and Richter always did at the end of their careers, but it would certainly look strange and would probably not be acceptable in younger players. The most devastating memory lapses occur in concertos, particularly when the ensemble with the orchestra breaks down, as in various debacles shown on Youtube, involving pianists such as Yundi (in Chopin 1 in South Korea) and Schnabel (in a performance of Mozart K488 ). The one occasion I actually came unstuck in a concert was as a schoolboy, playing the piano solo in Beethoven’s Choral Fantasia, a notoriously long and rambling piece. I missed an entry, and must have had 1000 nightmares about it over the years ! Some concertos are particularly prone to these problems, notably the last movement of the Schumann concerto, which modulates repeatedly to remote keys, and it is very easy to get lost. There is the additional problem of memorizing when to come in, after an orchestral tutti. One needs to rehearse the variable lengths of the orchestral tutti, particularly in the Brahms concerti, so that the entries are automatic, because a missed entry will be absolutely catastrophic. In conclusion, I don’t think that young pianists realize that their ability to learn and memorize new works will inevitably decline markedly in later on in life, and that this process starts to happen from the late 20s onwards. Alfred Brendel is reported as saying that his slowly developing career meant that he had more time in his 20’s to learn a large number of pieces, whereas those who have a major career early on may not find the time to do so. It is an incentive for all pianists to commit as much of the core repertoire to memory when still relatively young – ie under 30 – so that it is there to play and work on, over the next few decades. So if you are a young pianist, and always dream of giving your definitive Beethoven sonata cycle, to rival Schnabel and all the ‘greats’, later in life, you need to start now, and get the basic notes in your head, rather than leaving it to tackle some of them in middle age. And perhaps we should become more tolerant to the idea of solo pianists using the music during their recitals. It doesn’t necessarily imply that they haven’t done sufficient practice ! In a previous blog, written in June, I explained the rationale for establishing a new weekly series of piano recitals for outstanding pianists at St Mary’s Perivale. In brief, there are so many superb artists seeking concerts around London, yet there are very few venues which have a good piano, an interested audience, a suitable small hall and the ability (or desire) to pay their musicians. To provide more performing opportunities, we started the Tuesday afternoon recital series in July, and since then we have had 18 recitals, with 17 more planned before the end of April 2017. Including other concerts on Sundays and Wednesdays, a total of 46 pianists have given, or will give, recitals at St Mary’s Perivale between July 2016 and April 2017. The full list is included at the end of this blog, and all the recital programmes are published on our website,either in our archive section or in our forthcoming concerts. The series has been a resounding success. We were unsure whether we would attract an audience to St Mary’s Perivale at 2 pm on Tuesday afternoons, but the average attendance has been over 40, and has held up well in recent weeks despite the adverse weather. We have attracted an impressive roster of pianists, and all the recitals have been excellent. It is still impossible to provide a platform for all the pianists who wish to perform, and I currently have a ‘waiting list’ of about 25 more pianists. We initially planned to pay our Tuesday pianists a fixed sum of £100, but we were able to increase this to £200 following a generous anonymous donation, in sharp contrast to those central London churches and well-known private recital venues which give no payment whatsoever. The concerts are ‘free with retiring collection’, and the latter have kept pace with the fees paid to the pianists, so we are in surplus from these concerts. A few general points are worthy of mention. Firstly, the format of a short recital, lasting a maximum of 60 minutes including an encore, with no interval, works very well. I think many concerts, with about 90 minutes music in the traditional two-half format, are too long. The shorter length corresponds with most people’s attention span, and enables them to return home after 3 pm, before the rush hour. Secondly, holding concerts on a weekday afternoon has also proved very successful. Retired people like a specific focus to give structure to their day, and afternoon concerts, travelling in daylight, with relatively little traffic, are inherently more attractive than evening concerts, driving in the dark with rush-hour congestion. This obviously excludes attendance by people in work, but that also applies to most other concerts as well. People with busy jobs and families can rarely afford the time for concerts – but that will be the subject of a further blog. Thirdly, the sustained audience size, over a series of 17 weekly concerts, shows that they have not become bored with repeated piano recitals. This reflects the high calibre of our pianists, but we are also careful to ensure that the repertoire is sufficiently accessible to a general audience – ie not exclusively 20th century – and that musicians introduce their pieces. It is important to remember that even mainstream works such as the Liszt sonata or the Schumann Fantasy, are a tough ‘listen’ for a general audience, and a brief explanation by the pianist can be enormously helpful. All our concerts are recorded in high-quality video and sound, using our in-built recording system. This was upgraded from Standard to High Definition cameras in August 2016, and the quality of our recordings since then has been stunning. There must be few other venues which provide a free broadcast-quality recording for their musicians. We are very fortunate in having the help and expertise of several former BBC employees who have developed this video recording system. This will also be the subject of a further blog. Our publicity has been transformed in recent months by the liberal use of Facebook, with excellent photographs taken of most concerts by Roger Nellist and uploaded to our page, and to a lesser extent by the use of Twitter. St Mary’s Perivale is one of the most visually attractive venues in London, and the many concert photographs are helping to spread that message. This has certainly helped to raise our profile among musicians, although it remains to be seen whether it will increase our audience size, since few of our audience use social media. So we seem to have developed a successful formula of short piano recitals, on a weekday afternoon, providing valuable performing opportunities to outstanding pianists, with a reasonable payment and a free high-quality recording, on a good piano in an idyllic setting, and giving much enjoyment to a keen loyal audience. We hope to continue them indefinitely, and thus help to support all the wonderful pianists living in and around London. Here is the list of the 35 pianists who have played, or will play in the Tuesday recitals between July 2016 and April 2017.Dinara Klinton, Tamila Salimdjanova, Ashley Fripp, Mark Viner, Kausikan Rajeshkumar, Mei Yi Foo, Ben Schoeman, John Granger Fisher, Mihai Ritivoiu, Florian Mitra, Mengyang Pan, Alexander Ullman, Konstantin Lapshin, Ilya Kondratiev, Artur Haftman, Luka Okros, Pablo Rossi, Richard Uttley, Jianing Kong, Daniel Lebhardt, Marcos Madrigal, Emmanuel Despax, Costanza Principe, Lara Melda, Yuanfan Yang, Masa Tayama, Iyad Sughayer, Aristo Sham, Alim Beisembayev, Victor Maslov, Vitaly Pisarenko, Julian Trevelyan, Caterina Grewe, Tomasso Carlini. An older list of 318 pianists who have played in my Ealing concerts over the past decade is available here . Pianists – do you ever play ‘for the sheer joy of it’ ? I am interested in whether professional pianists regularly play the piano for their own enjoyment and satisfaction, for relaxation and fulfilment, rather than as a work-related activity, preparing a small number of works intensively for future public performance. Most will have spent many happy hours in their youth playing through Mozart and Beethoven sonatas etc, and learning many works by Schumann, Chopin and Liszt, for the sheer pleasure of recreating great masterpieces for themselves. This is why we all want to become pianists in the first place, and is why we teach and encourage the army of amateur pianists out there. After all, if the sole purpose of learning the piano were to give public recitals, most piano teachers would be out of work tomorrow ! Yet there is a risk that this love of the piano is lost later on, as pianists become young professionals, and have to put in all those endless hours of hard practice, and begin performing in public. They may adopt the necessary routine of polishing up a small number of pieces, over and over again – perhaps many thousands of times – for a big recital or competition, and the innate joy of music-making for its own sake may be lost. Some pianists work exclusively on a single recital programme for an entire season, to be taken round prestigious venues, often with repertoire which has been learned many years ago. Their daily practice consists of making these over-familiar works even ‘safer’ and ‘safer’, to guard against mistakes and the dreaded memory lapses. This may indeed be necessary to give satisfactory performances under immensely stressful conditions, but this ‘treadmill’ may be extremely stultifying and may be nothing less than mental torture, far removed from the pleasures of playing the piano for its own sake. I am reminded of Andre Agassi, who has stated that he absolutely hated tennis throughout his career, having practised so intensively in his early life, and I suspect that some famous pianists have the same ‘love-hate’ relationship with their instrument. It is interesting that so many prominent piano pedagogues stop performing in public in middle-age, while concentrating on developing the careers of their younger colleagues, after successful careers earlier on. Obviously they have less time to keep their playing to the necessary standard, but I wonder whether ever they play ‘for fun’, on their own at home, for relaxation and self-fulfillment, after a hard day’s teaching ? I rather doubt it. Perhaps they still associate the piano with all that ‘work’ they undertook years ago, rather than ‘pleasure’. However, I have known some musicians who have managed to keep their initial love of the piano and its literature, throughout long careers. I met the celebrated pianist Nikita Magaloff at his home in Switzerland, shortly before his death in 1992. He was actively learning some unfamiliar Schumann piano works for the first time, aged 80, and was totally enthralled by the beauty of the music. Similarly my old teacher, Jimmy Gibb, was learning new repertoire in his late eighties, when his faculties were failing, and his sheer love of the music shone through everything. I hope today’s pianists may emulate this, and that the huge pressures of giving public recitals don’t put them off the sheer joy of making music for their own private fulfilment. To summarize, I hope they continue to love the piano rather than end up hating it…. Author hmather@btopenworld.comPosted on 13th September 2016 19th February 2017 4 Comments on Pianists – do you ever play ‘for the sheer joy of it’ ? Repertoire choices by pianists – why so little Mozart ? We keep a detailed archive of works performed at St Mary’s Perivale. I have performed an analysis on piano works played between 2004 and 2015 – a total of over 500 concerts, with over 200 pianists. I suppose there have been about 200 half or whole-length solo recitals in that time. The musicians have a free hand in what they choose to play, although I occasionally ask them to change it if it is exclusively 20th century repertoire, as detailed in a previous blog about the tensions between what musicians want to play and what the audience want to hear. A summary of the pianists’ repertoire choices is on http://www.hughmather.uk/repertoire-piano.htm and makes for interesting reading. Top of the list is the ubiquitous Chopin G minor Ballade, studied by virtually all pianists, with 13 performances, although I am not sure that any of them have been entirely satisfactory – but that is a topic for another blog ! After that, the major Chopin piano masterpieces and popular Liszt virtuoso works (Rigoletto paraphrase, B minor sonata, Mephisto Waltz, Spanish Rhapsody etc) feature prominently, with several late Beethoven sonatas (Op 101, 109, 111) being performed more frequently than earlier Beethoven works. Rachmaninov’s Second sonata and Mussorgsky Pictures are also well-represented. Lower down the batting order, we find Ravel’s Gaspard, Debussy’s Images Book 2 and L’Isle Joyeuse, Schubert’s Wanderer and a cluster of favourite Schumann works. No, the explanation is obvious, although it will seem strange to non-musicians. Mozart’s sonatas sound easy, but are extraordinarily difficult to play well. By comparison, the big romantic works are much easier to ‘bring off’. Everything is so exposed – the phrase ‘walking on eggshells’ comes to mind – and problems of balance between the hands, of ‘inner phrasing’ and articulation in the runs, and handling all the trills and turns deftly and neatly, and achieving that rare spiritual balance between purity, warmth and freedom, may be beyond at least some of the pianists who choose Chopin, love Liszt or revel in Rachmaninov. These problems are generally more evident in the sonatas than the piano concertos, where the orchestral support solves some of the balance problems. There don’t seem to be many ‘Mozart specialists’ among the best young pianists around London at the moment. Perhaps they don’t get so far in competitions. If I were holding a piano competition, I would make a Mozart sonata a compulsory choice. Certainly there are no easy ‘plaudits’ for fine Mozart performances, compared with a rousing Liszt rendition, because the audience will assume it is easy – but never mind ! I am hoping we can encourage more musicians to be brave and play the Mozart (and Haydn) piano sonatas in their recitals in future. Author hmather@btopenworld.comPosted on 19th July 2016 19th July 2016 4 Comments on Repertoire choices by pianists – why so little Mozart ? Many of us enjoy listening to the brilliant young musicians who come from outside the EU to study at one of the London conservatoires. I have only recently started to understand the difficulties they face in surviving here, and being allowed to remain in the UK. I thought it might be interesting to describe the circumstances of one such musician. At his request, I am keeping his identity secret, but all the details below are accurate. He is an exceptional young pianist, in his mid-20’s who has a star-studded CV. He was born in the former Soviet Union, showed exceptional promise from an early age, trained with distinction at the Moscow Conservatory and won a scholarship to study at the Royal College of Music. He has won first prize in two important international competitions as well as several awards in other competitions. He is a charming young man who, to coin a phrase, plays like a god ! Yet he is in an impossible situation. Although his scholarship covers his tuition fees at the RCM, it doesn’t cover his living expenses, which need to be obtained from elsewhere. He is not allowed to teach piano or work in any other capacity. The immigration authorities require him to show that he has £11,000 in his bank account for a period of a month, in October, to prove that he can sustain himself, before they will give him a student visa to remain in the UK. He has won several awards of a few hundred pounds from various worthy funding bodies who support exceptional young musicians, but is still about £5000 short of the target, and is desperate to raise the funds to allow him to stay in the UK and to progress his career as a pianist. Various generous individuals have already contributed support, but it is insufficient. The RCM (and Professor Vanessa Latarche in particular) have been immensely supportive to this student, but there is little more they can do. I am writing this post for two reasons. Firstly, there may be some readers who would like to help this wonderful young musician so that he can complete his training. I have heard this pianist give outstanding recitals and I know enough about piano-playing to declare that he has exceptional talent. He is also a thoroughly charming person, and I cannot think of a more worthy recipient of support. If anyone would like to contribute to help him stay in the UK, please send me an email at hmather@btopenworld.com and I will put you in touch with him directly. I hope this might stir some generous souls to contribute. Why not help this very good cause ? Any support would be treated in strictest confidence, and would be gratefully received. Secondly, I am ashamed of our country’s attitude to outstanding young musicians. This blog steers well clear of political comment, particularly in the current climate, but when there are so many untraceable illegal migrants in the UK, it seems perverse to concentrate so hard on excluding supremely talented young musicians from the UK. This is a frequent problem for the many other brilliant musicians who want to remain here. London is still the music capital of the world, and so many of the world’s elite musicians live here. In terms of pianists, for example, this includes Brendel, Perahia, Uchida and Schiff, who were all born abroad and have contributed enormously to our cultural life. So why do we make it so difficult for their successors to settle here ? Wagner’s Ring Cycle – complete – in Ealing ! Ask any opera buff whether there is a fully-staged production of Wagner’s Ring Cycle in London this year, and they will confidently tell you that there isn’t one. They will be wrong. You only need to travel to North Ealing to experience the whole great cycle, on four consecutive evenings – August 18th to 21st – with world-class singers and a peerless orchestra, in a lavish and realistic production. St Barnabas Church PCC is indeed presenting the complete cycle from August 18th to 21st ! So if you need your annual ‘fix’ of a fully-staged Ring, there is no need to travel to Bayreuth or Seattle – come to Ealing instead. Of course, we will be watching a fabulous recording of the cycle, emanating from the Met, New York, from about 1990, in high quality sound and vision. Full practical details are on www.barnabites.org/wagner-ring-cycle/ . There is no need to book tickets, each opera will cost £10, and delicious food will be provided in the intervals. In fact, the church has been showing operas now for 5 years, with about 55 performances covering most of the core opera repertoire. The operas have given huge pleasure to many local people, particularly the elderly who would be unlikely to travel to Covent Garden, the Coliseum or Glyndebourne, and have raised funds for the church. The format really does work supremely well in practice. I am a huge fan of ‘canned opera’. The advantages over the ‘live’ experience are self-evident and too numerous to list, but include better singing, better vision, (usually) better sound, more ease in reading surtitles and no risk of singers cancelling because of a sore throat ! These are discussed in detail in a previous blog post http://www.hughmather.uk/wordpress/the-advantages-of-home-opera/ . I accept that there can be an extra ‘frisson’ of excitement with a live performance, but this usually turns into a massive frisson of irritation with modern productions. Watching ‘canned opera’ at home on one’s own can be a solitary and lonely experience, whereas being part of an audience experiencing an opera together, as at St Barnabas, is enormously enjoyable. All opera houses regard staging the Ring as their ultimate challenge –so St Barnabas PCC thought that it would take up this challenge as well ! It is a gamble, since many opera-lovers find Wagner very difficult, as do a surprising number of musicians, so we may struggle to find an audience. I am always amazed that so few young instrumentalists, for example, seem to know any opera in general, and Wagner in particular. And various friends who are superb musicians, particular (it seems) those with a choral background, seem allergic to what they regard as ‘overblown’, ‘emotionally incontinent’ music ! Perhaps it depends on one’s psychological make-up. I think the excessive vibrato of many Wagner singers is a potent factor in their distaste – this is indeed a problem and needs its own blog post. And it takes a certain amount of work to absorb the leitmotifs and the convoluted story of the cycle. I was given the Solti set of LPs as a Christmas present by my wife around 1980, and spent whole weekends listening the music while following the turgid libretto, line by line. Now it’s much easier to absorb the operas, watching them on DVDs instead. Robin Duval is giving an illustrated lecture on the Ring Cycle on the preceding Sunday evening at 7 pm to help people who are new to the Ring. He is considerable expert on Wagner, and this should be an excellent introduction. More details again are on www.barnabites.org/wagner-ring-cycle/ . The rewards are indeed great. One can’t be neutral about Wagner – either it leaves you cold, or it completely knocks you over ! Your first Wagner ‘trip’ – particularly Tristan, Walküre or Götterdämmerung – can be a ‘rite-of-passage’ experience – a veritable life-event. The cumulative emotional impact can be overwhelming. It really does, like Heineken, reach parts which other (composers) don’t reach, although I don’t think I should be too specific as to what they might be. One is left in awe of the genius of Wagner himself – regardless of his considerable personal failings. So come along and enjoy Wagner’s Ring Cycle in August, whether you know the cycle intimately or not. I am hoping that at least some people might have their ‘rite-of-passage’ experience in St Barnabas Hall in mid-August ! If you are already a Wagner fan, do come along – and please tell your friends. It will be a mind-blowing experience, and certainly the cheapest Ring Cycle you will ever experience. Come and be part of this special occasion. Author hmather@btopenworld.comPosted on 28th June 2016 28th June 2016 5 Comments on Wagner’s Ring Cycle – complete – in Ealing ! Over the past decade, at least 318 pianists, listed here, have played in my 1000 concerts at St Mary’s Perivale and St Barnabas Ealing. Some are no longer around, and many play chamber music or accompany singers, rather than give solo recitals, but there are at least 70-100 pianists who could, and would, present an excellent solo piano recital date at one of my venues. Although I run about 100 concerts a year, my current concert series aim to provide a balanced programme of solo piano, duos, piano trios and larger ensembles, wind music and vocal items. This variety is essential for a general audience, and piano recitals are perhaps less popular than, say, piano trios. So in practice I can only provide recital opportunities for about 20-25 pianists per year. This is clearly insufficient. Furthermore, some of our pianist have given regular recitals for several years, and built up a considerable local following, including Viv McLean, Ashley Fripp, Jayson Gillham, Mengyang Pan and Mishka Rushdie Momen, and are invited back. Thus it is currently difficult to give recital opportunities to more than a handful of ‘new’ pianists each year. Yet the number of outstanding young pianists based in London continues to enlarge inexorably, with exciting new ‘kids on the block’. These include the recent influx of outstanding pianists from the former Soviet Union, who have studied in Moscow and now are studying in London, and many from other parts of the world, although disappointingly few are from the UK. I receive at least 100 emails per year from ‘new’ pianists seeking a recital. All need, and deserve, regular performing opportunities, as a crucial part of their development as pianists. Regardless of talent, there is no substitute for wide concert experience, with different audiences, pianos and concert conditions. So this large pool of pianists are all competing for the limited number of recital slots available in and around London. From my personal experience, all are charming young people who are following a very difficult career path, and they deserve our help. Geoff Cox, a close friend who is also interested in helping young pianists, has produced a fascinating and invaluable survey of London concert venues, which I can heartily recommend, particularly since he has put my two venues at the top of his list ! On the face of it, there seems an abundance of recital opportunities. In practice, there are problems with many of the venues. Firstly, the standard of pianos is widely variable. Many churches were typically bequeathed a grand piano many decades ago – usually around 1950 – which is now in a mediocre state, or worse. Churches don’t usually have the funds to re-condition pianos, and a ‘beat-up’ old Bechstein will still be a ‘beat-up’ old Bechstein, even after restoration. The piano may supposedly be tuned ‘regularly’ – which may mean twice a year ! In reality, remarkably few venues have pianos which are good enough to enable exceptional pianists to show their true worth. So much of fine piano playing is about sound quality, yet this is frankly impossible to realize on the indifferent instruments available in many venues. String players don’t know how lucky they are ! Secondly, the number of recital opportunities at each venue is usually small. Many well-established music clubs have about 8-10 concerts per year, but may devote perhaps only 2 or 3 to solo piano recitals. All the amateur orchestras similarly have perhaps 2 piano concertos per season, so concerto experience is very difficult to find. Few concert series are devoted solely to piano recitals. Thirdly, the arrangements for paying musicians vary markedly, as noted in a previous post. Some of the most prestigious lunchtime recital venues in Central London, and some well-known private venues, offer no payment whatsoever, despite having retiring collections or charging admission. This is blatantly indefensible, whatever the charitable aims of the organisations hosting the events. Fourthly, the size and nature of the audiences are very variable. I have played lunchtime recitals in Central London churches with about 6 in the audience – mainly homeless people, asleep in the back row of the pews. Conversely, some up-market music clubs have a reasonable audience, but may comprise people who have come along for social rather than musical reasons, waiting for the drink or drinks in the interval, and may greet an outstanding performance with heart-sinking indifference. Enthusiastic and knowledgeable audiences are a rarity. So, looking through Geoff Cox’s list, there are relatively few venues which offer the golden combination of a good piano, a reasonable and keen audience, some sort of payment and the potential to host a significant number of piano recitals. Yet there are so many wonderful young pianists based in London seeking more performing experience and exposure.In response to this imbalance, we are setting up a new Tuesday Afternoon Piano Recital at St Mary’s Perivale in July. These will be at 2 pm, last one hour, and will feature carefully selected, outstanding pianists, who will receive £100 cash and a high-quality recording. The first four concerts are as follows : July 5th Dinara Klinton ; July 12th Tamila Salimdjanova ; July 19th Ashley Fripp ; July 26th Mark Viner. Full details of their recital programmes are here. If it is a success, we will continue the series from September onwards, throughout the year. Hopefully this will provide about 40 pianists with a recital opportunity every year. However, we do need to attract a quorum – perhaps 20-30 – of piano enthusiasts who enjoy listening to exceptional piano-playing, in comfortable and beautiful surroundings, with other like-minded piano fans. It is easy to travel out of London to St Mary’s Perivale on Western Avenue out of the rush-hour, and parking is free and readily available, and the concerts will be free admission with a retiring collection. So please help spread the word about our new piano series ! We hope that it will provide a invaluable service to many of the best young pianists based around London. We owe it to them to make this new initiative a success. Being a musician – a ‘proper job’ ? There is an old story which relates how a world-famous pianist gave a brilliant recital in a Yorkshire town, receiving a standing ovation, whereupon someone commented that ‘well he should be good – he’s never done a day’s work in his life ! ’ I have often thought about this anecdote over the years. I was brought up in Lancashire, and the overwhelming impression in those days, was that being a musician was not ‘a proper job’, in the way that being a doctor, for example, was. Looking back, this was a major factor in my decision to opt for medicine rather than music. I was expected to do a ‘proper job’ – with a proper income – rather than dissipate my life away practising Beethoven sonatas and Hanon exercises in a basement. Later in my career, when I was a Consultant Physician but also maintaining a musical career of sorts (www.hughmather.uk ), senior medical colleagues (particularly surgeons) would often ask me, in a patronising and sneering manner, ‘Are you still playing your piano ?’ They seemed to equate piano playing with fixing jigsaws – a childhood activity that one should grow out of, and certainly not an appropriate activity for a middle-aged professional man. So I am personally aware of the ‘stigma’ of being a musician. This jaundiced attitude to musicians evidently extends to the teaching sector as well. The ‘music master’ is always a figure of fun and ridicule in operas such as Don Basilio in Rossini’s Barber of Seville and many more. Mozart, in his Salzburg days, had to eat with the servants, as a mere musician. A friend who is Director of Music in a well-known school tells me that his post has much less ‘gravitas’ than, say, the Head of Classics or Science. Classical music is regarded as a dilettante pastime, which is OK for children to devote time to, if only to have something useful to put down on their University Entrance forms, but not a suitable occupation to take up professionally. In other words, it’s not that important thing – a ‘proper job’. In reality, being a classical musician is perhaps the toughest profession around, as any pianist will readily tell you, and certainly qualifies in my eyes as definitely a ‘proper job’. I undertook a medical career through sheer cowardice, not having the guts to pursue my original intention to pursue a career as a pianist and organist. Medicine was, and has been, an infinitely easier occupation, and it has been immensely rewarding – but it was nevertheless a ‘cop-out’ ! So I have immense respect for all the young people who are now trying to pursue a musical career, in a hugely competitive environment, against all the odds. The fact that large sections of the public have such a low regard for their efforts, and such little understanding of their motivation, is simply another cross which they have to bear. It is a further manifestation of the profound ignorance and lack of interest in classical music which is all around, and which we musicians sometimes forget. 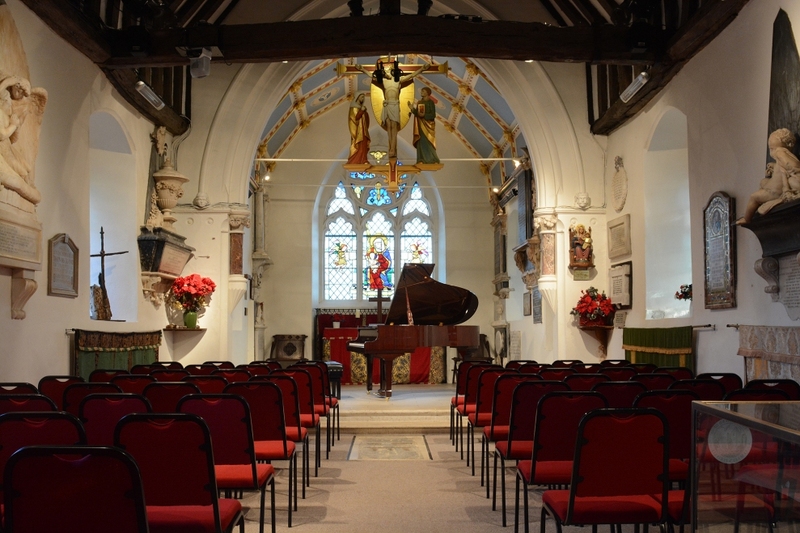 A world-class pianist playing at St Mary’s Perivale will attract an audience of 50, compared with 50,000 for a world-class pop-star or footballer. So hats off to all our musicians, who face all these vicissitudes and nevertheless strive towards the goal of improving their art, and in doing so, enrich all our lives ! Author hmather@btopenworld.comPosted on 25th May 2016 25th May 2016 23 Comments on Being a musician – a ‘proper job’ ?